Play poker like Justin Bieber - Superstar musician or schmuck? While one of the most controversial pop stars in the world has more money than we could possibly win in a pot, the star still likes to dabble in a game of poker every now and then. We take inspiration from Justin Bieber’s endearing (well, one way of putting it) everyday activities and how he plays poker so you can play and win a pot bigger than what we saw in that unmentionable photograph. We all know the best players have the best poker faces, but what better way to add to your poker face then pretending you are injured at your favourite casino venue of choice. If you have no idea what we are talking about, Bieber pretended to be injured and got pushed around Disneyland all day so he could skip the lines and get on the rides first. 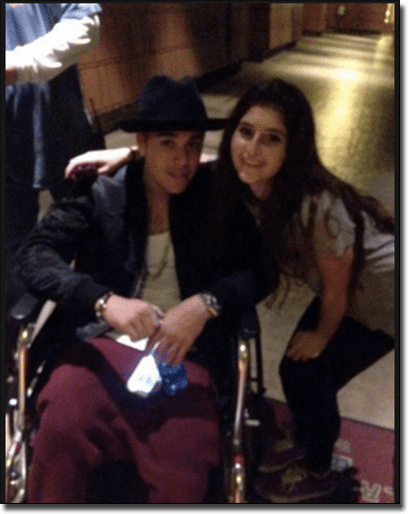 Simply rent a wheelchair as Bieber did and roll your way to the poker room at your nearest brick and mortar casino. The sympathy (more like silent disgust or pity) you will receive will have players more inclined to fold and you’ll roll out with the pot. While you can’t really do this online, it is a good tip from the genius Biebs for land-based poker rooms. Beibs has always been a big risk taker including when it comes to his hair. In early 2016, he was spotted with pastel purple hair, one of the biggest hair risks he has taken yet. Take this advice and apply it to poker and you’ve become one aggressive player who regularly takes risks including raising frequently and risking your opponent’s bluffs. This outlandish aggression will have many players backing down, but whether these risks pay off that’s for you to decide. Remember when Bieber said with such confidence Anne Frank ‘hopefully would’ve been a Belieber’. It’s this type of confidence which will see you bluff your way to the pot and we recommend employing it by becoming an arrogant type of poker player. Have as many stabs at the pot as you can and you’ll be a Belieber before you know it too. This will strike up an intimidation factor which will ultimately win you your hand. 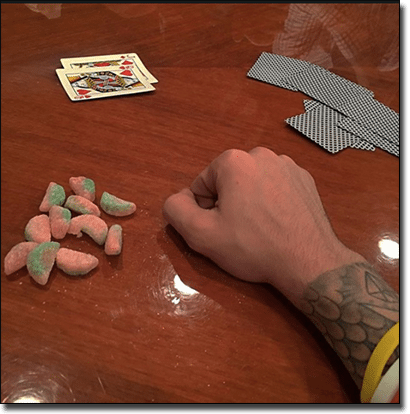 While Justin Bieber donned gold chains and brand names we’d have to mortgage out all our belongings to buy, he was photographed playing poker with sour patch kids – the sour flavoured gummy lollies. We find it a little hard to believe he couldn’t ruffle up a few hundred dollar bills or throw a spare watch in for the pot, leaving us to realise the best way to play like Justin Bieber is to go in head first and insult your opponents. Once you have gained some experience by playing your favourite poker variant, we recommend No Limit Texas Hold’em, we advise switching to a low-limit variant and taking all the money from your opponents as the lower limits generally see less experienced players. This will insult them because you’ve brought your high level of skill but only feel your opponents are worth peanuts. We recommend heading to www.FullTilt.com to play the varying limits for Texas Hold’em. 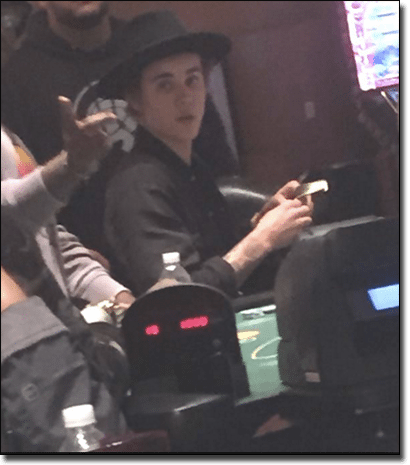 If you’ve ever seen photos of Biebs gambling at a casino you will notice he is always with a pack of friends – his entourage. This not only makes him more intimidating but it allows him to play them when there’s no one at the tables or in the poker rooms. Online you can invite your friends to play by sharing our links with them, and at land-based venues we recommend an entourage to scare off even the most experienced poker players. In 2014, Bieber turned to God and was baptised in a New York City bath. In doing so, he also swore off booze and other said substances and this is probably one of the best lessons we can take from the Beibs. While we have been joking around in this article, this advice is actually genuine. Never play poker under the influence of alcohol or other substance – as you are relying on a lot of skill and concentration to play the game and these substances inhibit your abilities. There’s no point playing if you are intoxicated as you will ultimately make rash decisions – such as not folding when you should have. While most of our advice should be taken with a grain of salt we do recommend playing at secure online poker sites such as PokerStars, Full Tilt Poker, and 888Poker. Sign up and opt in for their welcome bonuses too, and you’ll be playing poker as well as Justin Bieber.